This Bible came today!! My son grabbed up soon as I got it out of the box. We have been reading it together. He took notice of the instructions. The instructions said to read the following verses then build what you have read. I also noticed in the beginning the Bible instructed the children in how to use the Bible. Telling the children that the Bible is set by Books, chapters and verses. Helping the children in locating the books or verses they are looking for. I feel this makes the Bible less intimidating to children. 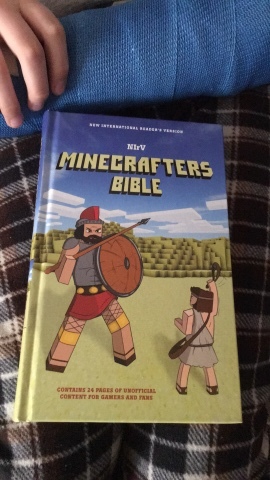 I think this will be a fun Bible to go through with your children. I may be a rare parent to play Minecraft with my child, but him being an only child I enjoy the memories we make together. We are building our Bible world from what we have read so far. The one where Jesus walks on water I look forward to what my son has planned for that one. The others would be where he takes up his cross, the Lord's supper, when He's born. He's talked about the 23rd Psalm and the Shepherds-this he said will be fun. I enjoy the reading we do together, but this just takes it to another level. I would recommend this to anyone with children who love Minecraft. Thanks for reading.